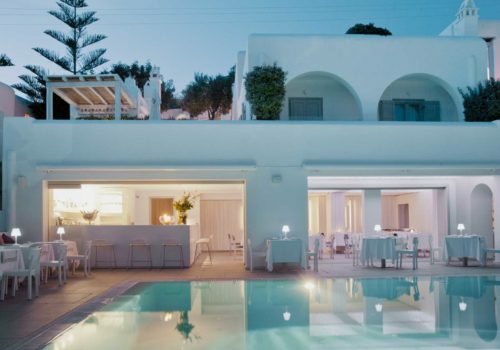 The Grace Mykonos is easily one of the most stylish hotels on the island. It’s part of the Grace luxury hotel chain. The hotel is located on a cliffside overlooking Ágios Stéfanos beach, 2.8 km away from Hóra, the island’s capital. The hotel operates a free shuttle service – handy, as taxis in Mykonos are few and far between. The style is pure Cycladic elegance. Expect whitewashed walls, lightly accented colours and clean lines. With just 32 rooms and a small lobby, the overall feel is intimate. It’s also refreshingly quiet at night. Some of the rooms are on the small side but they are very stylish and comfortable. The bathrooms have rain showers and even his-and-his sinks for gay couples. Higher category suites have hydromassage showers, big terraces, plunge pools and whirlpool tubs. The hotel has a well-equipped gym and spa. The Deluxe Rooms overlook the western side of the island of Delos. The upgraded rooms have heated plunge pool on your private terrace – very satisfying. The king-size beds are very comfortable and you can select from a pillow menu. The bathrooms have Apivita amenities. The Junior Suites come with a verandah and full al fresco dining area. You can unwind in the living area – the sofa can be converted into a double bed. 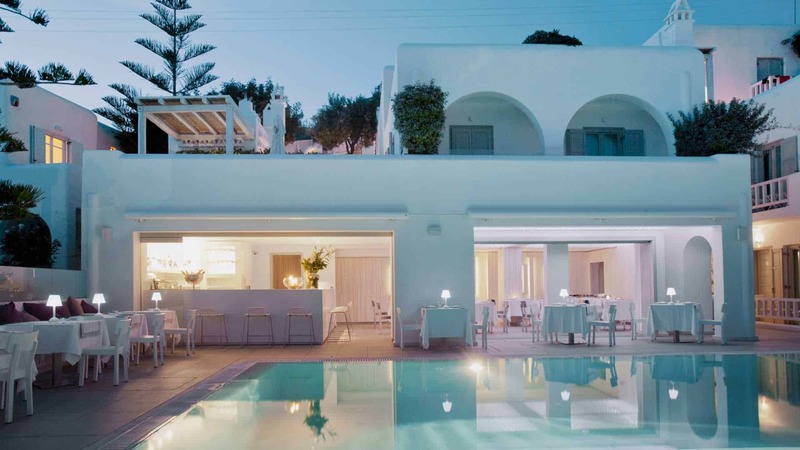 With uninterrupted 180-degree island views, this is the ideal spot for a gay honeymoon in Mykonos. French windows open onto a portico overlooking Agios Stefanos beach and the lights of Mykonos town. A divine setting for your first days as a married couple. Ideal if you’re looking for extra space and a dash of added luxury. The Mykonos Suites come with spacious living rooms with sea views. Your private verandah overlooks Delos and Mykonos town. The Mykonos Suites have one bedroom but can interconnect with a deluxe room for larger groups. The Grace Restaurant is excellent. Breakfast includes pastries, juices and fruits with regularly updated a la carte options. For supper, you can opt for excellent seafood dishes and more. The wine list is top notch.